All transactions are safe and secure with a reliable history in online purchasing behind each of our associates. Buy the Simpsons Springfield Isotopes t-shirts to own Simpsons clothing and merchandise. This unique piece of Simpsons merchandise refers to the town of Springfield's minor league baseball team the Springfield Isotopes. The team name is likely a reference to the town's nuclear power plant. Homer Simpson was the Isotopes mascot for a while until he was fired. This tee promotes the team that is sponsored by Duff Beer. These Springfield Isotopes Simpsons t-shirts are available in both men's and women's styles. 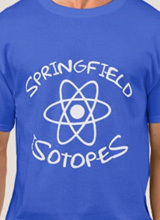 Get a Springfield Isotopes t-shirt and cheer on the team. They can use all the support they can get. In addition to the Simpsons Springfield Isotopes tees above, browse the Simpsons Clothing Gallery for more apparel like men's and women's clothes, kids shirts or hoodies.